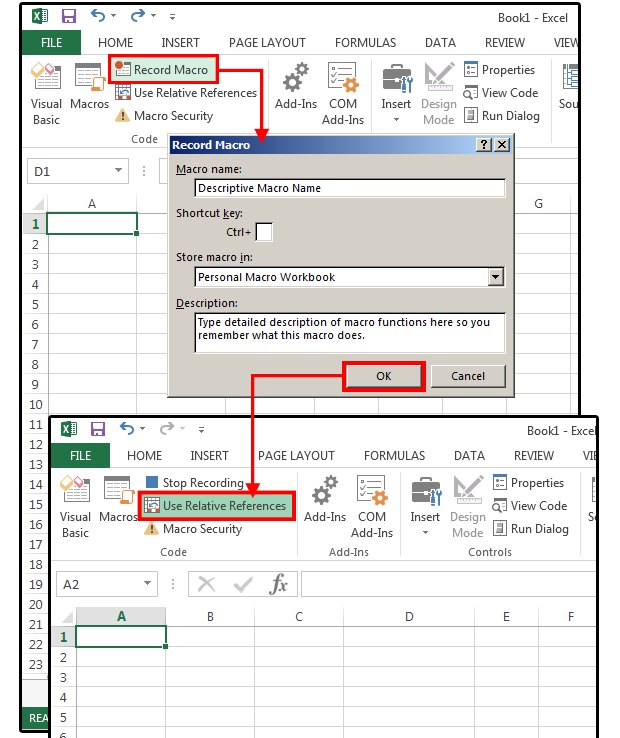 Excel macros save you time and headaches by automating common, repetitive tasks. And you don’t have to be a programmer or know Visual Basic Applications (VBA) to write one. With Excel 2013, it’s as simple as recording your keystrokes. Use these tips to make macro recording a cinch. Keep macro names short (but descriptive), especially if you record a lot of macros, so you can easily identify them in the Macro Dialog Box. The system also provides a field for Description, though not everyone uses it. Macro names must begin with a letter and cannot contain spaces, symbols, or punctuation marks. After the first letter, you can use more letters, numbers, or the underscore character, but the maximum length is 80 characters. Absolute means that the exact cell locations are recorded into the macro—hardcoded cell addresses such as A6 or B12, which limits the macro’s ability to function if anything changes, new data is added/removed, or the list gets longer. Relative means the macro’s recorded keystrokes are relative to the starting cell’s location. In the Record Macro dialog box, enter a macro name and Shortcut Key (if applicable). Choose Personal Macro Workbook in the Store Macro In box, enter a description (if desired), and click OK. The dialog box disappears, and the Record Macro button changes to a Stop Recording button. Click the Relative Reference button next—it turns dark green to indicate that it’s active. Enter your keystrokes, formulas, and so forth, then click the Stop Recording button and run your macro. 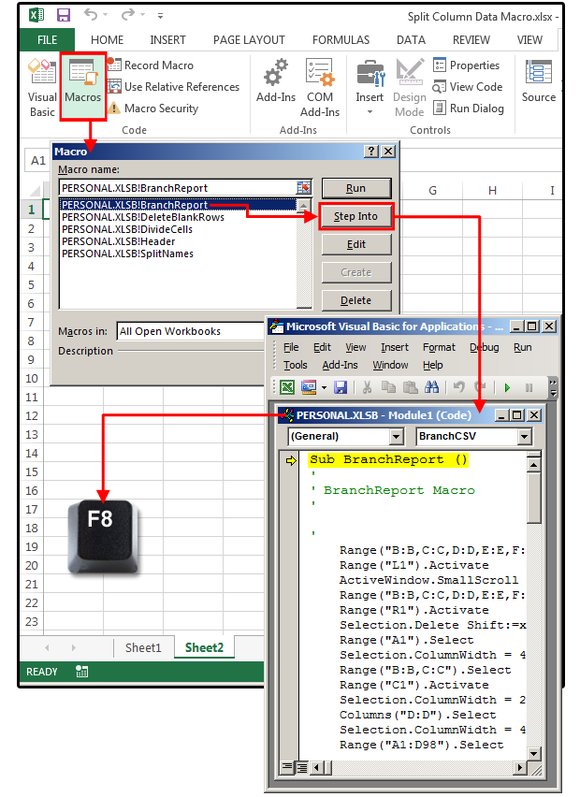 Record macros using Relative Cell addresses. For Absolute reference macros, always begin in the Home position (cell A1)—with your cursor and your data. If you saved your macro in the Personal Macro Workbook (recommended), you can reuse this macro on other worksheets with similar data. Regardless of where your cursor is positioned when you begin recording the macro, even if it’s already located in cell A1, your first macro keystroke must be Ctrl+Home. Example: Imagine that every month you receive dozens of spreadsheets from all your branch offices that you must first combine, then organize, and calculate to produce one monthly report. You can write a macro to perform all of these functions, including opening and combining all the worksheets into one combined spreadsheet. For this exercise, I’ll just address the final spreadsheet with the combined data. Create a new workbook in Excel (e.g., April Report). Your cursor is automatically located in the Home position (A1). Do not move it to accommodate titles, field headers, or anything else. It must be positioned in A1. Open the first branch workbook and copy the entire spreadsheet’s data (minus the column headers) to cell A1 in your April Report spreadsheet. The data begins in A1 and ends in G55. Open the second branch workbook and copy the entire spreadsheet’s data (minus the column headers) to cell A56 in your April Report spreadsheet. Continue this process until the data in all workbooks are copied into your April Report spreadsheet. If the other spreadsheets’ data contains formulas, choose Paste>Special>Values for your Paste options. Do not copy the formulas or the formats. Don’t worry about a worksheet title, column headers, or formatting (such as column widths, fonts, etc.) at this point. Just copy the data and run the macro. Use the directional keys (End-Down, Ctrl+Up, etc.) to position your cursor so you can add, change, or delete the data inside the spreadsheet as needed. Using the mouse to navigate is more complicated and not as reliable. When it comes to macros, use the mouse only for selecting or clicking menu options. Keep your macros small and specific to the tasks at hand. The bigger the macro, the slower it runs, especially if it’s required to perform many functions or calculate a lot of formulas in a large spreadsheet. Also, if you combine all the tasks into one long macro and it fails, it takes forever to locate the point of failure. If you run each macro separately, you can quickly review the results and verify accuracy. Step through an Excel macro with F8. In the April Report example, you wouldn't combine the calculation macro with the format macro. You'd use one macro to combine all the branch workbooks into one final spreadsheet, a second macro to calculate the data, a third macro to format the spreadsheet, a fourth macro to create charts, and perhaps a fifth macro to print. If a macro fails, you can troubleshoot it by stepping through it one line at a time. It’s like slow motion, only you control each time the next event occurs using the F8 key. Click Developer>Macro, select your macro from the list, then click the Step Into button. Shrink the Code window down and place it on the bottom right side of the screen so you can see your spreadsheet behind it. Press F8 each time you want the macro to proceed to the next step. The macro stops when it reaches the error. You can then repair the error or record a new macro.